You do not have to put yourself in harms way to enjoy the thrill of a zombie outbreak! We offer a number of awesome zombie games that are inspired by the undead apocalypse. These zombie-inspired games provide a chance to enjoy some quality time with friends and family while sharing your love of zombies culture. 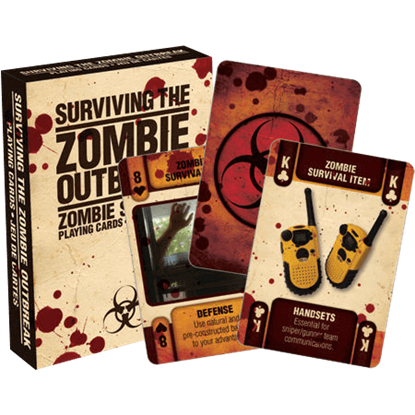 Whether you want a zombie board game, zombie card game, zombie trivia game, zombie travel game, or other zombie entertainment, we are sure to carry something to interest you. Certain zombie apocalypse games will have you attempting to survive the shambling hordes. Can you find a cure for the zombie infection? Or will you simply seek to destroy them all? Other games offer tips to educate and help you prepare, or challenge you to test your knowledge of zombie facts and fiction. Peruse our growing selection of zombie outbreak games to find great ways to spend your free time. Who says that you cannot learn about how to survive the zombie apocalypse and have fun at the same time? 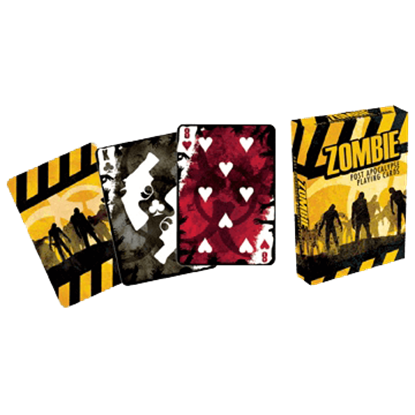 The Zombie Outbreak Playing Cards share tips on each of the cards of this poker-sized playing deck. These zombie-styled cards are a quality source of entertainment before and after the zombie apocalypse. With the Zombie Post Apocalypse Playing Cards, you can play card games to pass the time, while entertaining yourself and others. Is there a way to test your knowledge about zombies while having loads of fun? 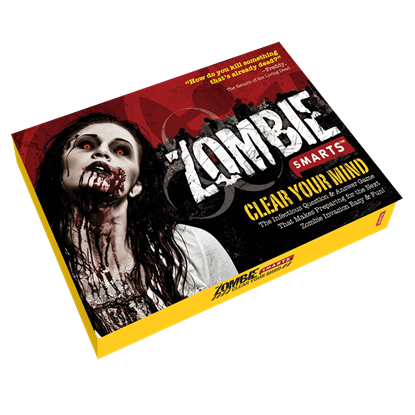 This Zombie Smarts Game is an infectious question-and-answer game that features grisly facts about the history, habits, and hungers of the living dead. Thank you. I already ordered and used the credit. I am sorry the sword broke but your customer services is fantastic and I will recommend your website. Thank you again.